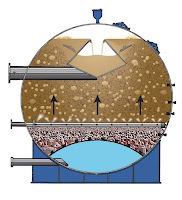 Improve your overall filter performance and help reduce backwash frequency by optimizing every backwash. Gather a sample of backwash water halfway through Simul-Wash™ or a backwash. Swirl the sample in a jar; if there is media present, this will cause it to settle in the bottom-center. Allow settling for a few minutes and note if there is media present. Any media collected should be negligible – less than a dime in size and very fine in texture. If you see an excessive amount of filter media, your backwash water rates are probably too high. This will also affect your filter performance and degrade your media lifetime. Adjust the flow rates to get highest rate without excessive media loss. If you haven’t checked the rates recently (over the last 12 months), then using the above technique, gradually increase flow while sampling, until a trace of media is observed. Then back off this rate. Simul-Wash™ and backwash durations vary depending on your raw water quality and frequency of backwash. Simul-Wash™ about 6 to 10 minutes; purge the air out of the media for about 2 minutes; then backwash until the water is translucent without any solids, about 1-5 minutes. Each plant’s backwash duration will vary depending on your specific application and water conditions. If you have questions, by all means call us to discuss! Remember, for quality filter performance, making sure your filter media gets clean during backwash will improve overall filter performance.